Today ONLY (3/16) - HSN - FOOD &amp; WINE™ 3-piece Nonstick Diamond Pattern Bakeware Set $29.95 (Retail $54.39). 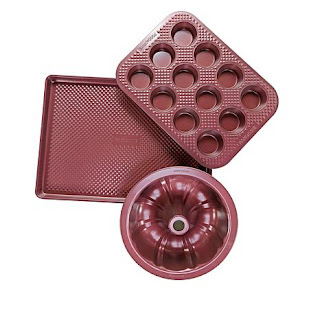 Make a marvelous meal and a decadent dessert with this sturdy nonstick bakeware. Designed for optimal versatility, each piece in this set is for much more than baking. Make frittata hors d'oeuvres in the muffin pan, roast chicken in the bundt pan and bake chocolate chip cookies on the sheet pan. Thanks to their carbon steel construction and Whitford nonstick coating, these pans distribute heat evenly for consistent results and make cleanup a breeze.